Cities are increasingly emerging as the new centers of technological innovation. A shift is under way from technology parks in suburban areas, where universities, research labs, and the private sector are located together, to entrepreneurial activity within cities. Studies on venture capital (VC) investment in the United States reveal that innovation is moving from suburbs to downtown cities (MPI, 2014). Today, San Francisco hosts more VC investment than SiliconValley and New York City, where the innovation startup scene was nascent a decade ago, has become the second-largest tech startup ecosystem in the United States, with over $3.1 billion in VC investment in 2013 (Endeavor Insight 2014). This trend is not unique to the United States. Startups are burgeoning in major cities around the world, including London, Berlin, Madrid, Moscow, Istanbul, Tel Aviv, Cape Town, Mumbai, Buenos Aires, and Rio de Janeiro, to name a few (see Figure 1.1). Factors such as proximity, density, and variety of people and firms contribute to this phenomenon (Athey et al 2007). New technology trends have lowered the cost of innovation and allowed entrepreneurs to enjoy the benefits from agglomeration economies. Cloud computing, open software and hardware, social networks, and global payment platforms, among other things, have made it easier to create a startup with fewer physical resources and personnel. If in the 1990s an entrepreneur needed $2 million and months of work to develop a minimum viable prototype, today an entrepreneur would typically need less than $50,000 and six weeks of work (Center for an Urban Future 2012) and, in some cases, these costs can be as low as $3,000 (Mytton 2009). This trend is allowing entrepreneurs to take advantage of city agglomeration effects to a greater extent than before. Entrepreneurs “want to live where the action is” – that is, in places where other young people, social activities, peers, and entrepreneurs are located (Florida 2013). Entrepreneurs look for conventional startup support, such as mentor networks or role models, as well as nightlife, meetups, social activities, and other potential “collision” points, a combination best provided by cities (Satell 2013). Innovation is becoming urban; what was previously the preserve of “innovation parks” is now growing organically within cities. In this paper, urban technology innovation ecosystems are defined as the collection of stakeholders, assets, and their interactions in city environments resulting in technology (in particular ICT)-based innovation and entrepreneurship. The unit of study of this research is the city area of influence, understood as the core metropolitan area. The terms “urban” and “city” are used interchangeably to refer to the ecosystem. Urban technology innovation ecosystems not only increase the number of technology startups in cities but also result in new employment and economic growth by creation of new businesses and employment categories. In New York City, the technology sector has increased jobs faster than in other sectors and accounts for 12 percent of city tax revenue (HR & A Advisors 2014). From 2006 to 2013, the technology innovation ecosystem in New York City created over 500,000 new jobs (see Figure 1.2). The positive correlation between growth in the ICT industry of a city and job creation is being observed in other cities as well. Bangkok has been adding over 3,000 jobs a year to its ICT industry (National Statistical Office of Thailand). In Barcelona, ICT is recognized as a key industry with 29 percent of all companies and 48 percent of employees involved in the knowledge economy (Barcelona City Council 2012). Medellin generates over $100 million a year from Business Process Outsourcing (BPO) and has attracted a number of multinationals to establish BPO centers in the city (Keshetri et al 2012). As the economy evolves into what many think is a “third industrial revolution” (The Economist 2012) that may erode traditional manufacturing jobs and those requiring routine cognitive skills, the creation of new sources of employment and growth is paramount to maintaining competitiveness, reducing poverty, and increasing shared prosperity. The emergence of technology innovation ecosystems in cities presents an opportunity for developed and developing countries alike. Globally, over half of the population lives in cities (United Nations 2014), and this percentage approaches 80 percent in regions such as Latin America. The fastest urbanization rates in the world are in Africa and Asia (Phillips 2014; United Nations 2013; and United Nations 2014). Developing countries can tap into the growing resource of human capital and talent to produce innovation centers within their own countries that generate growth, entrepreneurship, and employability while addressing local problems. Tech and entrepreneurship skills have become easier to develop for unskilled and unemployed populations, especially young people. For instance, coding and open hardware skills that previously took years to learn can now be trained in months or even weeks. There is anecdotal evidence that these programs are increasing employability and entrepreneurship in these ecosystems (Meng 2013; and Amirtha 2014). However, technology innovation ecosystems are not growing equally in all cities. Some cities are experiencing higher, faster, and more sustainable growth of these ecosystems than others, resulting in a higher number of startups, investment, employment, and economic growth. It is as yet unclear what factors cause different growth rates and how this growth can be supported with policy actions. Research suggests that density of people and firms and agglomeration effects play a critical role (Carlino and Kerr 2014; and Pan et al 2013). There seems to be a positive correlation between the size and density of the city and the organic growth of urban tech innovation ecosystems, as the ecosystems tend to emerge first in the largest cities, such as New York, London, Mumbai, Sao Paolo, or Shanghai (Pan et al 2013). However, it is unclear why some of the largest and densest cities grow their ecosystems at different rates, or why some smaller cities, such as Manchester or Helsinki, have strong technology innovation ecosystems. The World Bank has been involved in a number of activities with client countries to build ecosystems of technology-led innovation. Through these activities, we have observed factors that support the growth and sustainability of urban technology innovation ecosystems. We find that creating and supporting a community of tech entrepreneurs, coupled with incentives for kickstarting the ecosystem, for example through competitions and challenges, and provision of rapid skills programs, often provides a formula to grow and sustain technology innovation ecosystems. Table 1.1 lists some of the World Bank activities related to technology innovation ecosystems that follow this formula. Appendix B provides more details on these activities. Through these activities, we have observed how urban tech innovation ecosystems develop and grow in cities with different population sizes and wealth characteristics, ranging from three hundred thousand inhabitants in Manizales to two million in Beirut. Anecdotally, we have found that connections and communities play a key role in the surge and sustainability of these innovation ecosystems. Partners in these activities, including city governments and entities supporting urban innovation from Amsterdam, Barcelona, Helsinki, New York, and the Republic of Korea, have arrived at the same conclusions (see Appendix A for details of these partners). This finding implies that the emergence and sustainability of urban technology ecosystems can be supported with policy actions, and that those policy actions can obtain results in the short term (that is, one to three years). Some cities, such as New York, are already creating technology innovation ecosystems with this hypothesis in mind (see text box). Given that connections and communities play a key role in the growth and sustainability of innovation ecosystems, which can be supported with policy actions, a research project was developed to identify the key success factors to grow, develop, and sustain technology innovation ecosystems in cities in order to inform policy actions. Research began by identifying and reviewing existing studies applicable to urban technology innovation ecosystems. Following this review, and taking into account experiences with working with client countries and partners, a framework was developed to test the following hypothesis: Connections and communities are key success factors for the growth and sustainability of urban technology innovation ecosystems. This hypothesis was tested for New York City and initial results are presented in this working paper. The framework identifies and categorizes key success factors for the growth of an urban technology innovation ecosystem and compares the impact of such factors to different ecosystems across cities. Ultimately, it is expected that the framework can be used to assess the impact of policies to grow and sustain urban technology innovation ecosystems. A measurable framework is lacking that enables urban innovation ecosystems to be compared across cities. However, there is consensus on the critical factors that impact innovation in cities. Building upon these factors, operations experience, and the experiences of partners, a framework was developed. This report is concerned with both of these aspects and in their translation through entrepreneurship into startups. The literature is ripe with studies relating innovation to ecosystems (Durst and Poutanen 2013). An innovation ecosystem parallels the environmental concept where interrelated elements strive for equilibrium. The ecosystem is modeled as an economic equilibrium resulting from the interaction between various innovation actors (for example, business, universities, government) (Jackson 2011). There are several definitions of innovation ecosystems in the literature. Mercan and Göktaş (2011) define an innovation ecosystem as consisting of “economic agents and economic relations as well as the non-economic parts such as technology, institutions, sociological interactions and the culture.” The Brookings Institution, applying this concept to urban environments, but limiting it to districts, defines an innovation ecosystem as “a synergistic relationship between people, firms, and place (the physical geography of the district) that facilitates idea generation and accelerates commercialization” (Katz and Wagner 2014). This section begins with a review of indexes and studies that include factors of innovation in cities. This is followed by a review of studies of models for innovation ecosystems in cities. These elements are analyzed to develop an urban tech innovation ecosystem framework. Hot Spots 2025: Benchmarking the future competitiveness of cities (EIU 2013) notes, “Global business is beginning to plan strategy from a city, rather than a country perspective.” It defines a city’s competitiveness as the ability to attract capital, businesses, talent, and visitors, also important criteria for city innovation ecosystems. The index ranks 120 cities across the world using 32 mainly qualitative indicators grouped into eight categories: economic strength, physical capital, financial maturity, institutional character, human capital, global appeal, social and cultural character, and environment and natural hazards. The Global Cities Index (GCI) (A.T. Kearney 2014) states, “By creating an environment that spawns, attracts, and retains top talent, businesses, ideas, and capital, a global city can generate benefits that extend far beyond municipal boundaries.” The GCI measures the level of city global engagement covering 84 cities using 26 metrics in five categories: business activity, human capital, information exchange, cultural experience, and political engagement. A study ranking cities by GDP per capita (OECD 2006) finds that labor productivity is the main factor in explaining differences. Innovation is intimately tied to productivity; cities with high value-added activities such as high-tech and advanced services are closely linked to R&D activities and the generation of innovation. The study notes that applicants located in cities file over 80% of patents in the countries studied. The Most Innovative Cities in Asia Pacific (Solidance 2013) uses six categories to measure the level of innovativeness in 16 cities in the region: human talent, knowledge creation, technology, society, government, and global integration. The findings are aimed at informing companies about the “most attractive places” in terms of an effective innovation ecosystem. Key factors include availability of educated and skilled people attracted by diversity and amenities; ability of universities, enterprises and government to produce knowledge; the livability of a city and its ability to sustain culture; the level of technology in the city; a favorable regulatory environment; and global integration and future orientation. The New York Economic Development Corporation has created a New York innovation index. The index tracks progress in six dimensions related to resources directed towards innovation and the results of such innovation in the city’s economy. Inputs to innovation include R&D, Finance, Human Capital; outputs include Intellectual Property, High-tech Gross City Product, and Entrepreneurship and Employment Dynamics (NYEDC 2011). Winden et al (2007) in a first approach looking at the knowledge economy in cities finds that the quality of city foundations and successful organizing capacity are important for generating human capital and knowledge-based industries that then generate innovation. This framework focuses on factors to develop the knowledge economy in cities, including the knowledge base (human capital), the industrial structure, quality of life and amenities, accessibility (infrastructure), diversity, scale, and social equity. Schaffers et al (2011), taking the perspective of smart cities, propose a framework where all city economic activities and utilities form the innovation ecosystem, with citizens and organizations participating in its development via supply and consumption of goods and services. Crowley (2011) proposes a framework with three main elements: urban firms and entrepreneurs, institutions, and human capital (see Figure 2.1). Firms and entrepreneurs are at the core, driving the supply and demand for innovation. Institutions, including governments, universities, research centers, business organizations and others, create and spread knowledge, a key driver of innovation. The third component in this framework is human capital. Crowley (2011) argues, “The concentration of highly skilled people in one place promotes the exchange of ideas and learning, facilitating the process of innovation.” Cities need to attract talent by providing the adequate environment. Three key drivers of innovation are proposed: networks, markets, and wider conditions. Firms and entrepreneurs connect with institutions and people through networks. These networks promote collaboration, and help generate ideas and disseminate knowledge. Markets, including consumer markets and public procurement, drive the demand for new products and services. People’s mobility within the labor market contributes to knowledge dissemination. Finally, Crowley finds that the wider conditions, such as good schools, availability of financial resources, well-maintained infrastructure, and adequate housing available, also contribute to the success of an innovation ecosystem. The European Commission (EC) (2013) considers a city innovation ecosystem to consist of the processes linking citizens (People) with a built environment (Place) and public organizations and policymakers (Public) through business (Private) (see Figure 2.2). With over two thirds of Europeans living in urban areas, the EC recognizes the importance of promoting innovation to enhance economic growth and increase citizen welfare. Comparative advantages: unique characteristics of the city. Economic assets refer to institutions, organizations and enterprises that drive, cultivate or support innovation. Thus, economic assets are categorized in three types: (i) Innovation drivers, focused on developing cutting-edge products and services (for example research institutions); (ii) Innovation cultivators, support the growth of entrepreneurs (for example incubators, accelerators, coworking spaces, community colleges); and, (iii) Neighborhood-building amenities, provide support to workers and residents (for example, coffee shops, retail stores). Physical assets refer to private and public buildings and infrastructure that allow collaboration and connectivity. Public assets include parks and streets. Public spaces not only bring people together, but they also can serve as labs to test new products. Private assets include private spaces and buildings, such as office affordable office spaces for startups. There are also physical assets that help “knit the district together”, such as sidewalks, bike lanes and public spaces, and others that connect the district to the city and the world, such as transportation and broadband. Networking assets refer to the relationship between the ecosystem’s actors. These networks and cultivate and accelerate innovation through the exchange of information and ideas, and the increased collaboration. Networking assets can build strong ties (for example, workshops and conferences) or weak ties (for example, networking events and hackathons). These four categories are connected through networks and markets. This last element finds traction in the most recent two frameworks proposed (Bell and The Brookings Institution). The Brookings Institution framework expands the concept to networking assets, which include events that create community, such as meetups or challenges and collaboration spaces, such as coworking spaces, accelerators, or incubators. Work with country clients on activities related to developing and strengthening urban innovation ecosystems corroborates these categories. Several urban innovation ecosystems have been mapped by the World Bank and the Research Partners (see Appendix A for World Bank activities and Appendix B for Research Partners). Through these mapping efforts, these four categories have been identified as the main components of city innovation ecosystems. As urban innovation ecosystem growth and development relies increasingly on community building and sustainability, networking assets have become more relevant and central. This importance is also experienced by city partners, which are focusing on developing and sustaining these communities (see Appendix B). The first four elements result from agglomeration effects and provide a picture of the ingredients that the city must possess in order to develop and grow its innovation ecosystem. The networking element acts as a multiplier of these factors that can boost the size and rate of growth of the ecosystem. As creators and sustainers of communities, the networking element can increase the number of "collisions” that result in innovation within cities. Collisions are random encounters with people one would normally not meet. The theory of collisions argues that these encounters bring new ideas, perspectives, and value for creating opportunities and innovation (Kaplan 2012). The more collisions individuals have with people with different ideas, the more creative and innovative these individuals may become (Satell 2013). Hence, the potential for collisions stimulates innovation and entrepreneurial opportunities (Roberts 2014). 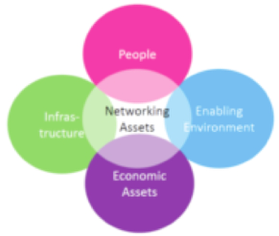 Networking assets (as defined in the following section) increase the potential for collisions, acting as a multiplier of the existing elements produced by the agglomeration effects in the city innovation ecosystem (see Figure 3.1). Based on this premise and borrowing concepts from the literature review, a holistic framework to map and diagnose city innovation ecosystems in developed and developing countries was proposed. The following section describes this framework and its elements. The framework to map and diagnose urban innovation ecosystems comprises two layers. The first introduces the four categories that result from agglomeration effects and that are common in the literature. The second layer, which is a multiplier of the agglomeration effects, is networking assets. All these elements interact with each other, but only networking assets function as multiplier for the ecosystem growth. This framework is presented visually in Figure 3.2. People are the basic element for innovation to happen. Innovation results from the interactions and the work of people. A survey of tech entrepreneurs in the United States highlighted the talent pool of employees as being the most important business-related resource that cities offered (Endeavour Insight 2013). The “creative class” has been cited as an important factor for generating economic output in cities (Florida 2002). A number of characteristics of a city’s population have a bearing on innovation and growth. One of the most important is that growing populations generate an increase in productivity (Hardesty 2013). Other people-related factors affecting innovation include the share of immigrants, number of residents with a college degree, the labor force and its characteristics, the number of patent holders, and so on. People also form part of the innovation support network by serving as mentors and guides and are a testing ground for innovative products and services. Within the proposed framework, this category maps the characteristics of people that increase the potential for innovation, including their diversity, in terms of background and education, their level of education, and the education and training capacity of the city, including provision of technology-related training. Economic Assets include the elements that: (i) interact with people to increase the number of ideas resulting in innovation and, (ii) allow for implementing these ideas into practical innovation. This category maps elements such as the variety of industries, business and sectors; the size, amount, and diversity of companies and businesses; the universities and research and development facilities; the maturity and size of the technology and creative industries; and the availability and size of innovation-oriented investment firms, particularly for providing seed financing. Infrastructure facilitates interactions among people and economic assets. This category maps the infrastructure in the city that: (i) provides basic living conditions, (ii) facilitates access to people and knowledge, or (iii) facilitates random collisions. This includes transportation infrastructure, broadband access, parks and venues for events, festivals, cafes, restaurants, theaters, and so on. 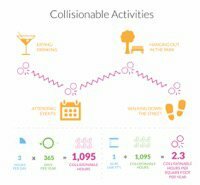 Green spaces attract talent to live in the city and provide a venue for collisions, in the same way as the amenity sector. Offices are needed to house tech firms; startups need inexpensive and adaptable venues (that is, flexible office space). Physical and digital connectivity—transport and communications networks—bind city neighborhoods “together and/or tie it to the broader metro area” (Katz and Wagner 2014). Enabling Environment refers to public policies and the government commitment to promote innovation. This category identifies: (i) the enabling environment provided by the government for innovation to occur, and (ii) the degree of commitment, promotion and facilitation by the government for development of the innovation ecosystem. This category maps policies such as doing business, property and IP protection, business associations, as well as specific policies to promote the innovation ecosystem, such as open data, challenges, innovation promotion, and so on. Networking assets increase the number of collisions in the ecosystem, multiplying the effect provided by agglomeration. Innovation ecosystems will produce higher results in terms of, for instance, (i) increased number of startups, (ii) increased value of startup exits, (iii) increased employment in tech innovation related activities, if the number of random collisions increases. This category maps the main networking assets, including meetups, tech community events, bootcamps and skill training programs, collaboration spaces, accelerators, incubators, angel investors, venture capital, and networks of mentors. Accelerators, incubators, angel investors, and venture capital are hybrid assets with economic assets but the impact of their network of mentors and entrepreneurs makes them more valuable for the growth and sustainability of the ecosystem; therefore, they are categorized as networking assets. The financing functions of these assets are included in economic assets under seed capital and financing. Table 3.1 presents an indicative list of networking assets. If networking assets are multipliers of the agglomeration effects in urban innovation ecosystems this means that networking assets are central to the ecosystem and that connections among stakeholders are central to the growth and sustainability of such ecosystems. This rationale supports the understanding of urban technology innovation ecosystems as a community (or a combination of communities) (see Appendix B). This hypothesis was tested through a combination of qualitative (interviews) and quantitative (data analytics) approaches in New York City’s ecosystem. To familiarize itself with the city ecosystem and its main actors—government agencies, entrepreneurs, coworking spaces, and accelerator spaces—the team conducted 21 interviews with actors to learn about the development of New York City’s tech innovation ecosystem. From these discussions, the team began to identify sources of data in New York City that describe the tech innovation ecosystem. The interviews also provided insights on New York City’s ecosystem, its growth, and the role of networking assets, such as meetups, competitions and collaboration spaces. The interviews also allowed the team to learn about the policies of New York City, its impact, its successes and failures, and how it evolved to support the growth and sustainability of the ecosystem. For the data analysis, the team used available data sources to quantify the value of networking assets via their centrality in the ecosystem as well as the impact of geography on the ecosystem and how geographical and social connectivity centrality affected the performance of startups (in terms of capital raising). Because it used mainly CrunchBase and Angel List data, the team focused the analysis on accelerators and incubators. These are collaboration spaces providing investment along with (and sometimes as primary function to) their networking functions. This phase of the research did not analyze community building events or skills training programs and events because insufficient sources of data were available. In addition, because this phase of research focused on testing the effectiveness of the proposed social network analysis methodologies against publicly available data sources, research focused on exploring the dataset at a static point in time and did not explore impacts over time. These additional perspectives can be addressed in future research (see Chapter 4). The findings from the analysis of four research questions in relation to New York City’s urban innovation ecosystem are summarized below. As mentioned above, the results presented here, and in more detail in Appendix E, are interim findings resulting from the data sources and limitations of this research. Final outputs will be produced as a result of forthcoming research and analysis. Data sources and methodologies are also described in detail in Appendix E.
In order to measure the value of networking assets in urban innovation ecosystems, research explored the impact of connections on ecosystem success outcomes. Following this, the value of incremental connections was quantified, enabling us to rank and value individual networking assets by multiplying their success in creating new connections by the value of incremental connections. Connections are defined as either social or geographic. While there are multiple metrics that can be used to define success, this analysis considers the raising of a round of funding as a successful outcome for startups and by extension the ecosystem as a whole. As such, the analysis focuses on examining the interplay between the geographic, social, and funding dynamics within New York City’s urban innovation ecosystem. The findings of this analysis (see Appendix E) support the hypothesis that the social dimension, or the connections and communities, of the ecosystem is critical for the growth and sustainability of the ecosystem and that networking assets, defined as community building events, skills training events, collaboration spaces, and networking of mentors, are central to this social dimension. First, networking assets (using accelerators and incubators as a proxy) are central to the ecosystem’s social dimension, being nodes of connection for startups and other stakeholders. Second, social momentum of startups has a direct impact in their success (in terms of funding). However, there is not such impact with the geographic dimension of startups. Finally, the social dimension of startups expands and provides diversity to the ecosystem beyond geographical clustering or technology districts’ boundaries. These initial findings support the hypothesis that networking assets are central to urban technology innovation ecosystems. This implies that networking assets are the connectors which: (i) sustain the social network of the ecosystem, and (ii) have the potential to boost the ecosystem’s growth by increasing the collisions that result from social connections. By being central to the ecosystem and these connections, networking assets would play a critical role in the growth and success of urban technology innovation ecosystems. Either the social dimension of startups determines their success (in terms of capital raising) or success determines the of startups centrality for the ecosystem (in its social dimension). Compared to this social dimension, the geographic dimension or clustering of startups does not seem to play a critical role in their success (in terms of capital raising) or centrality within technology urban innovation ecosystems. This seems to imply that the geographic dimension of startups is just one of many mechanisms to contribute to the social dimension of startups. In urban environments, the geographic dimension becomes less relevant. In particular, in New York City, with an extensive, affordable and fluid transportation network, the geographic contribution seems to be rather small compared to that of networking assets. These initial findings have important implications because they position networking assets as significant factors of technology innovation ecosystems in cities. The significance of these assets combined with the importance of a startup’s social dimension compared with its geographic dimension are important considerations that should inform the policy of cities that support the growth and sustainability of these types of ecosystems (see section 3.4). These findings are preliminary and based on limited sources of data. However, in combination, they provide support to the hypothesis that: (i) fostering the increase of connections, and building a community are critical actions to grow and sustain technology innovation ecosystems, and (ii) that networking assets play a key role in creating both of them. These findings are reinforced by the insights from the interviews the team conducted and the recent research produced in New York City’s technology innovation ecosystem by Endeavor Insight. This research (Endeavor Insight 2014) found that connections have been critical in the growth and sustainability of the ecosystem and that they provide a virtuous cycle for growth. Endeavor Insight mapped the connections of over 650 entrepreneurs and key actors in the ecosystem, showing the growth in size (about 25 per cent CAGR from 2003 to 2013) and complexity (see Figure 3.3) as the ecosystem grew exponentially to become the largest in the United States during that period of time. These findings are limited by the characteristics of the city object of this research (New York City), the limitations of data sources (see Appendix E) and scope of analysis (limited types of networking assets). Transportation and connectivity (for example, broadband) infrastructure in New York City provides easy physical and digital transit within the city, and may reinforce the importance of social connectivity compared with geographic connectivity. In other cities, different transportation and connectivity infrastructure (for example, long daily commute, poor public transport, limited broadband access), may impact this result. Data from voluntary reporting by members of the ecosystem may not provide a complete or unbiased picture of reality. Finally, networking assets, such as community building events and skill training programs, are critical in the hypothesis of ecosystems as a community (or combination of communities). This research did not analyze the impact of these events and programs. For these reasons, the findings presented in this paper should be considered as interim and further research and analysis is planned in a subsequent phase of the study (see Chapter 4). The significance of networking assets for the growth and sustainability of technology innovation ecosystems in cities and the importance of startups’ social dimension compared with their geographic dimension have policy implications for cities and other policy actors that want to support the growth and sustainability of technology urban innovation ecosystems. The most relevant implications for policy design and implementation are that: (i) technology innovation ecosystems in cities need to be understood as a community or combination of communities, and (ii) the focus of policies to support these ecosystems is the community (defined by its social dimension) and not a geographic area (for example, a district or technology park) within the city. By understanding the innovation ecosystem as a community, where social connections play a critical role, policies can better target the bottlenecks and market failures precluding or slowing the growth of the ecosystem. Policy to support the ecosystem should focus on fostering the development of networking assets that kickstart communities (for example, challenges, hackathons or competitions), build networks (for example, meetups, networks of mentors), or provide platforms for community building (for example, collaboration spaces). Bringing legitimacy to the community can play a critical role in its initial growth and further expansion. Promotion campaigns and support that produce role models and highlights the community of entrepreneurs help to support this goal. Additionally, providing rapid skills training programs enlarges the potential members of the community and expands the sense of belonging by providing cohorts of new members. This is one of the approaches pursued by New York City, and many other cities with growing ecosystems are now following their lead (see Box 1.1). Furthermore, this approach is also shaping the World Bank’s innovation ecosystem-related activities (see Appendix B). The research team will review policies adopted by cities and other relevant actors as well as case studies and lessons learnt in the following phase of this research in collaboration with city partners to expand the diagnosis tool (see chapter 4). If the focus of policies to support the growth and sustainability of the ecosystem is the community, these cannot be limited to a geographic area (that is, a district or technology park). Policies that focus on the geographic will have less impact and may completely ignore the key factors that make an ecosystem sustainable. This, of course, does not mean that policies that target specific geographic areas (for example, neighborhoods or districts) cannot be effective. However, if the objective of such policies is to support the technology innovation ecosystem, their target should be the features of the ecosystem’s social dimension. Geographically targeted policies should only complement this broader objective. The findings presented in this working paper are the outcome of the beginning of a larger research. Some of the findings are based on initial analysis and need further work, largely because of limited data and because research was mainly restricted to New York City. For future research, the sources of data will need to be expanded, additional cities will need to be researched (including those in both developed and developing countries), and the analysis of networking assets will need to include the remaining assets that could not be covered in the initial phase. This research will need to be carried out with research and city partners (see Appendix A). how city governments can build effective policies to support the growth and sustainability of urban technology ecosystems. The first topic will provide insights into the potential for employability and growth in the current environment of economic transformation where traditional sources of employment are changing. Existing policies and their impact on ecosystem’s growth and sustainability will be analyzed as well as the results in producing employability. Additional resources and partnerships will be required in order to undertake some of this additional research. The next steps and future work that the research team envisions undertaking is described below. The team will plan to continue its research on networking assets and their role and impact on the growth and sustainability of urban technology innovation ecosystems. The team will need to access more data sources (including enriched data from survey and interviews and social network data) and will need to work in more cities as it conducts data gathering with its city partners (see below). The team will then explore the role of community building networking assets (for example, events to kickstart and sustain communities, collaboration spaces and mentors of networks) and analyze impacts over time. The scope of research will need to be expanded to include more cities. This includes working with partner cities to collect data through a common methodology agreed with the research partners. For the data collection process, cities will be prioritized based on those in the Working Group that have shown interest in participating in this process. The list of city members of the Working Group is shown in Appendix A. Research on the impact of urban technology innovation ecosystems on employment and economic growth will be expanded. This will include exploring the relationship between ecosystems and the creation of new jobs, the role of the ecosystem as an ad hoc skills training program, and the impact of networking assets and rapid technical training programs on employability, with a particular focus on the poor and uneducated population. It will also explore the impact of the ecosystem on economic growth and economic transformation within cities, and in poverty reduction. Research will be focused on developing country cities to explore the potential of these ecosystems for providing additional sources of inclusive growth. The team will also work with its city partners to compile and analyze policies applied to support urban technology innovation ecosystems. This compilation will provide additional resources for policymakers to understand approaches to: (i) support the growth and sustainability of urban technology innovation ecosystems, and (ii) increase the impact of the ecosystem for employment and growth. Case studies to highlight best practice will be provided. Endeavor Insight is the research arm of Endeavor, which seeks to deepen understanding of how high-impact entrepreneurs contribute to job creation and long-term economic growth in order to educate key constituencies, such as policy makers. Endeavor Insight seeks to serve as a knowledge center for high-impact entrepreneurs, VCs and others in order to provide useful information and tools that assist high-impact entrepreneurs as they grow their business. MaRS Innovation and NESTA are also participating in similar research on urban innovation ecosystems as part of GERN. MIEP’s objective is to strengthen technology-led innovation ecosystem and foster entrepreneurship and employability in Lebanon. The project focus is to grow and sustain the ecosystem community, expand technical and entrepreneurial skills and to expand the technology ecosystem throughout the economic sectors in Lebanon. Skills training for youth and entrepreneurs. The activity will develop a series of crowdsourcing competitions, which will include intense hand-on training (for example, bootcamp style) with a light acceleration phase. The result of this competition will be a series of startup projects (that is, minimum viable prototype beta tested, a business plan and a pitch). The competitions will also include an international mentorship program and exchange to connect the Lebanese ecosystem to others. In addition, this activity will create a university-industry platform for industry project training and a series of technology skills activities for schools. The university-industry platform will provide final-year students to team up with industry to solve real challenges from companies through a start-up or product projects in a 6-month timeframe. Growth and sustainability of the tech-innovation community. The activity will develop network of mentors, links among entrepreneurs and networking events (for example, meetups) to support existing community. The activity will also complement existing collaboration spaces and provide technology tools (for example, maker space), labs (for example, living labs), and a space for community networking. This space will be managed by an innovation hub (the Mobile Innovation Hub, MiHub), which will serve to coordinate the community and the community-building activities. The MiHub will also take the role of promoting the community and its exemplary members. Innovation for legacy industry and other sector of the economy. The activity will develop a series of hands-on workshops and activities between technology startups and entrepreneurs, and legacy industries that have not integrated widely technology in their production processes. This activity will also develop exchange activities with experts from other innovation ecosystems globally. This project is supported by a Trust Fund of the Korean-World Bank partnership. Smart City Gran Concepción activity objectives are: (i) to introduce open innovation in municipal government, (ii) to use the government as a platform to kickstart the local technology innovation ecosystem, and (iii) create the mechanisms to develop a sustainable technology innovation ecosystem to solve city challenges and create entrepreneurship and employability. Hands-on skills training on open innovation methodologies to city officials. Cocreation of a vision for technology support for urban transport with the city ecosystem (for example, government, academia, private sector, civil society, technology hubs, citizens). Challenge competition of city challenges to kickstart the technology innovation ecosystem and develop solutions to city problems. Cocreation of local innovation hub with the stakeholders of the city ecosystem (for example, government, academia, private sector, civil society, technology hubs, citizens). This activity was funded by the Spanish Trust Fund for Latin America and the Caribbean. The objectives of this activity are to promote local government transparency, efficiency and e-services delivery to improve public service delivery and ultimately the quality of life of the population. To achieve this goal, the activity introduced open innovation in three cities in Colombia: Barranquilla, Cali and Manizales. Cocreation of e-services (for example, mobile apps) with city officials and rapid prototyping. Cocreation of a roadmap for technology support to city services and eliminating departmental silos. Challenge competition of city challenges as mechanism of open innovation for municipal governments and development of local entrepreneurship. Development of strategic plan with local ecosystem stakeholders (for example, government, academia, private sector, civil society, technology hubs, citizens) to support government’s open innovation and development of local entrepreneurship. This activity was funded by the Information Communications Technologies (ICT) Korean Trust Fund. The objectives of this activity is the co-creation of new knowledge and the dissemination of good practices on urban technology and innovation that the city of Barcelona and its partners have developed over the years. The main areas of focus relates to bottom-up innovation and how city government can engage with the city ecosystem to develop innovation and entrepreneurship that addresses urban challenges. The activity organizes Citisense (an annual event on bottom-up approaches to urban innovation) together with Smart City Expo World Congress, and the City as a Laboratory training course (a practical program for policy-makers to introduce open innovation in city government) and develops common research on urban innovation and entrepreneurship. Victor Mulas leads this research and is the coauthor of this working paper with Hallie Applebaum and Michael Minges. Kathy Qian, Nga Phuong Nguyen and Mary Alexander Sherman conducted the data analysis. Matt Gee and Nick Eng from the University of Chicago (Computation Institute and Harris School of Public Policy) provided advice and guidance and participated in the research. Beatriz Eraso, Marta Milkowska and Scott Henry supported the team and contributed to the drafting and Colin Blackman edited this working paper and Samhir Vasdev was its creative director. The following colleagues peer reviewed or provided comments for this working paper: Maja Andjelkovic, Elena Gasol, Nicolas Friederici (Oxford Internet Institutue, Oxford University), Justin Hill, Tim Kelly, Stefano Negri, Arturo Muente-Kunigami Eric Strobl (Paris Ecole Polytechnique) and Ilari Lindy. Valerie Mocker, Kathleen Stokes, Alice Casey, and Kristen Bound, from NESTA, also provided support and connected us with other partners. The team would also like to express its gratitude to the professionals, practitioners and entrepreneurs for agreeing to interviews and for sharing their knowledge and experiences. This research and its continuation would not have been possible without the support and encouragement of the research and city partners that have engaged with the team during this paper’s production (Appendix A). The team would like to especially thank the University of Chicago (Computation Institute and Harris School of Public Policy), Matt Gee and Nick Eng; Endeavor Insight, Rhett Morris and Matt Lerner; the offices of New York Council members Laurie Cumbo and James Vacca; and the New York Economic Development Corporation (NYEDC), Dmytro Pokhylko and Gianluca Galleto for their active collaboration and support in this research. The generosity of these partners has made this research possible and its results relevant by increasing the resources available to the team including providing insight and access to essential data sources and methodologies through the Global Entrepreneurship Research Network (GERN). This research has been supported by the City of Barcelona through the Barcelona Urban Technology and Innovation Hub and the Finish Government through the World Bank-led Community of Practice on Open Innovation. Ajuntament de Barcelona. 2014. “Anuario Estadístico de La Ciudad de Barcelona 2014.” http://www.bcn.cat/estadistica/castella/dades/anuari/index.htm. Amirtha, Tina. 2014. “Do Coding Bootcamps Produce Inferior Engineers?” Fast Company. http://www.fastcolabs.com/3028635/do-coding-bootcamps-produce-inferior-engineers. Athey, Glenn, Catherine Glossop, Ben Harrison, Max Nathan, and Chris Webber. 2007. Innovation and the City: How Innovation Has Developed in Five City-Regions. NESTA. http://www.nesta.org.uk/sites/default/files/innovation_and_the_city.pdf. A.T. Kearney. 2014. Global Cities Index. http://www.atkearney.com/research-studies/global-cities-index. Atkinson, Robert D., and Adams Nager. 2014. The 2014 State New Economy Index. Washington, DC: The Information Technology & Innovation Foundation. http://www.itif.org/publications/2014-state-new-economy-index. Baigorri, Manuel. 2013. “Spain’s Startups Leave in Search of Venture Capital.” BloombergBusiness. http://www.bloomberg.com/news/articles/2013-04-21/spanish-preference-for-property-over-startups-deepens-woe-tech. Barcelona City Council. 2012. ICT Sector in Barcelona. http://barcelonacatalonia.cat/b/wp-content/uploads/2012/12/eng-ICT-23-03.pdf. Barrera, Alex. 2013. “The Spanish VC Industry Has One Big Problem: It Doesn’t Exist”. tech.eu. http://tech.eu/features/51/spain-vc-industry-missing/. Barth, Alex. 2013. “New York City and OpenStreetMap Collaborating Through Open Data”. Mapbox. https://www.mapbox.com/blog/nyc-and-openstreetmap-cooperating-through-open-data/. Belderbos, Rene, Shanqing Du, and Dieter Somers. 2014. “Global Cities as Innovation Hubs: The Location of R&D Investments by Multinational Firms.” In DRUID Academy. Aalborg, Denmark. http://druid8.sit.aau.dk/druid/acc_papers/rdv4by82h7nbyph96iuix18cu71s.pdf. Bell, Thatcher. 2014. “Elements of an Innovation Ecosystem.” http://thatcherbell.vc/elements-of-an-innovation-ecosystem/. Bloomberg. 2014. “Silicon Savannah: Kenya’s Billion Dollars Tech Bet.” http://www.bloomberg.com/news/videos/b/fa73fc02-c511-4824-806d-5656acdfae7c. Burke, Adrienne. 2013. “Why Zappos CEO Hsieh Wants To Enable More Collisions In Vegas.” Forbes, November 15. http://www.forbes.com/sites/techonomy/2013/11/15/why-zappos-ceo-hsieh-wants-to-enable-more-collisions-in-vegas/. Carlino, Gerald and William Kerr. 2014. Agglomeration and Innovation. Harvard Business School. http://www.hbs.edu/faculty/Publication%20Files/15-007_e181fd00-4426-4db8-8f70-89b1b5054a8f.pdf. Cowan, Matt. 2013. “The Origins of Silicon Roundabout.” Wired, April 9. http://www.wired.co.uk/magazine/archive/2013/04/londons-moment/birth-of-a-meme. Crowley, Lizzie. 2011. Streets Ahead: What Makes a City Innovative? The Work Foundation. http://www.theworkfoundation.com/Reports/306/Streets-Ahead-What-makes-a-city-innovative. CrunchBase. 2014. CrunchBase Data Exports. 2014. http://info.crunchbase.com/about/crunchbase-data-exports/. Cushman & Wakefield. 2014. “Office Space Across the World 2014.” http://www.cushmanwakefield.hk/en-gb/research-and-insight/2014/office-space-across-the-world-2014/#anchor. Durst, Susanne, and Poutanen, Petro. 2013. “Success factors of innovation ecosystems - Initial insights from a literature review.” http://blogs.helsinki.fi/pkpoutan/files/2014/03/Durst_Poutanen_CO_CREATE2013.pdf. The Economist. 2012. “The Third Industrial Revolution.” http://www.economist.com/node/21553017. The Economist Intelligence Unit (EIU). 2013. Hot Spots 2025: Benchmarking the Future Competitiveness of Cities. http://www.citigroup.com/citi/citiforcities/pdfs/hotspots2025.pdf. Endeavor Insight. 2013. What Do the Best Entrepreneurs Want in a City? http://www.endeavor.org/blog/endeavor-insight-report-reveals-the-top-qualities-that-entrepreneurs-look-for-in-a-city/. Endeavor Insight. 2014. The Power of Entrepreneur Networks: How New York City Became the Role Model for Other Urban Tech Hubs. http://www.nyctechmap.com/nycTechReport.pdf. European Commission. 2013. European Capital of Innovation Award. http://ec.europa.eu/research/innovation-union/pdf/icapital/poster.pdf#view=fit&pagemode=none. Florida, Richard. 2002. “The Rise of the Creative Class.” Washington Monthly, May. http://www.washingtonmonthly.com/features/2001/0205.florida.html. — 2013. "The New Global Startup Cities". http://www.citylab.com/work/2013/06/new-global-start-cities/5144/. Hardesty, Larry. 2013. “Why Innovation Thrives in Cities.” MIT News, June 4. http://newsoffice.mit.edu/2013/why-innovation-thrives-in-cities-0604. HR&A Advisors. 2014. “The New York City Tech Ecosystem.” http://www.nyctecheconomy.com. Hsu, Jukay. August 2014. Telephone interview. International Labour Organization. International Standard Classification of Occupations (ISCO). http://www.ilo.org/public/english/bureau/stat/isco/isco08/index.htm. Jackson, Deborah J. 2011. “What Is an Innovation Ecosystem?” http://erc-assoc.org/sites/default/files/download-files/DJackson_What-is-an-Innovation-Ecosystem.pdf. Kaplan, Saul. 2012. “The ‘random collision’ theory of innovation.” Fortune. http://fortune.com/2012/05/09/the-random-collision-theory-of-innovation/. Katz, Bruce, and Julie Wagner. 2014. “The Rise of Innovation Districts: A New Geography of Innovation in America.” Metropolitan Policy Program. Brookings Institution. http://www.brookings.edu/about/programs/metro/innovation-districts. Massachusetts Technology Collaborative. 2014. The Massachusetts Innovation Economy Annual Index. http://masstech.org/press-releases/masstechs-annual-innovation-index-shows-new-opportunities-and-emerging-challenges. Meng, Victoria. 2013. “The Ultimate Guide to Coding Bootcamps: The Most Selective Bootcamps.” Skilledup. http://www.skilledup.com/articles/the-ultimate-guide-to-coding-bootcamps-the-most-selective-bootcamps/. Miller, P. and Bound, K. 2011. The Start Up Factories. NESTA. http://www.nesta.org.uk/sites/default/files/the_startup_factories_0.pdf. Mulas. 2014. “Categorizing the collaboration and community promotion spaces that make urban innovation ecosystems tick.” http://blogs.worldbank.org/ic4d/categorizing-collaboration-and-community-promotion-spaces-make-urban-innovation-ecosystems-tick. Mytton, David. 2010. “How much does it cost to start a tech company?” https://blog.serverdensity.com/how-much-does-it-cost-to-start-a-tech-company. NAICS Association. North American Industry Classification System (NAICS). http://www.naics.com. National Statistical Office of Thailand. Various years. Labor Force Survey. http://service.nso.go.th/nso/nso_center/project/search_center/23project-en.htm. NYCEDC. 2011. NYCEDC Innovation Index. http://www.nycedc.com/sites/default/files/filemanager/Resources/Economic_Data/InnovationIndexReport.pdf. OECD. 2005. Oslo Manual. http://www.oecd.org/innovation/inno/oslomanualguidelinesforcollectingandinterpretinginnovationdata3rdedition.htm. —. 2006. OECD Territorial Reviews: Competitive Cities in the Global Economy. http://www.oecd.org/gov/regional-policy/oecdterritorialreviewscompetitivecitiesintheglobaleconomy.htm. — 2010. Measuring Innovation: A New Perspective. http://www.oecd.org/site/innovationstrategy/measuringinnovationanewperspective-onlineversion.htm#agenda. Owen, Vicki. 2014. “High Rents Driving Technology Start-ups Out of London’s ‘Tech City’.” This is Money. August 2. http://www.thisismoney.co.uk/money/smallbusiness/article-2714273/High-rents-driving-technology-start-ups-Londons-Tech-City.html. Pan W., Ghoshal G., Krumme C. Cebrian M. and Pentland A. 2013. “Urban characteristics attributable to density-driven tie formation.” Nature Communications. http://dspace.mit.edu/openaccess-disseminate/1721.1/92362. Phillips. 2014. “African Urbanization.” Harvard International Review. http://hir.harvard.edu/archives/6038. Roberts, Bryce. 2014. “Collision Hours.” Bryce Dot VC. http://bryce.vc/post/81685761115/collision-hours. Satell, Greg. 2013. “Why Cities Are Our Most Important Innovation Platform”. http://www.forbes.com/sites/gregsatell/2013/11/09/why-cities-are-our-most-important-innovation-platform/. Schaffers, Hans, Nicos Komninos, Marc Pallot, Brigitte Trousse, Michael Nilsson, and Alvaro Oliveira. 2011. “Smart Cities and the Future Internet: Towards Cooperation Frameworks for Open Innovation.” In The Future Internet, 431–46. Lecture Notes in Computer Science 6656. Springer Berlin Heidelberg. http://link.springer.com/chapter/10.1007/978-3-642-20898-0_31. Scola, Nancy. 2014. “The ‘Choreography of Collisions’ That Makes Innovation Districts Tick.” Next City. http://nextcity.org/daily/entry/brookings-institution-innovation-districts-report. Shanghai Municipal Government. 2014. “Infrastructure of Information.” http://www.stats-sh.gov.cn/tjnj/nje11.htm?d1=2011tjnje/E1418.htm. Solidance. 2013. “The Most Innovative Cities in Asia-Pacific.” http://www.asiainnovativecities.com. Tammy, Johns, and Lynda Gratton. 2013. “The Third Wave of Virtual Work.” Harvard Business Review. http://www.crowehorwath.com/folio-pdf-hidden/TheThirdWaveofVirtualWork_FW13206V.pdf. United Nations. International Standard Industrial Classification of All Economic Activities. Revision 4. http://unstats.un.org/unsd/cr/registry/regcs.asp?Cl=27&Lg=1&Co=J. United Nations. 2014. World Urbanization Prospects. http://esa.un.org/unpd/wup/Highlights/WUP2014-Highlights.pdf. United Nations. Economic and Social Commission for Asia and the Pacific. 2013. Statistical Yearbook for Asia and the Pacific 2013. http://www.unescap.org/stat/data/syb2013/ESCAP-syb2013.pdf. US Census Bureau. 2014. “County Business Patterns (CBP).” http://www.census.gov/econ/cbp/. —. 2014. “American Community Survey.” http://www.census.gov/acs/www/. Winden, Willem van, Leo van den Berg, and Peter Pol. 2007. “European Cities in the Knowledge Economy: Towards a Typology.” Urban Studies 44 (3): 525–49. doi:10.1080/00420980601131886. Source: Katz and Wagner 2014. Table 2.2 summarizes the categories of these framework approaches. Work with country clients on activities related to developing and strengthening urban innovation ecosystems corroborates these categories. Several urban innovation ecosystems have been mapped by the World Bank and the Research Partners (see Appendix B for World Bank activities and Appendix B for Research Partners). Through these mapping efforts, these four categories have been identified as the main components of city innovation ecosystems. As urban innovation ecosystem growth and development relies increasingly on community building and sustainability, networking assets have become more relevant and central. This importance is also experienced by city partners, which are focusing on developing and sustaining these communities (see Appendix B). The first four elements result from agglomeration effects and provide a picture of the ingredients that the city must possess in order to develop and grow its innovation ecosystem. The networking element acts as a multiplier of these factors that can boost the size and rate of growth of the ecosystem. As creators and sustainers of communities, the networking element can increase the number of “collisions” that result in innovation within cities. Collisions are random encounters with people one would normally not meet. The theory of collisions argues that these encounters bring new ideas, perspectives, and value for creating opportunities and innovation (Kaplan 2012). The more collisions individuals have with people with different ideas, the more creative and innovative these individuals may become (Satell 2013). Hence, the potential for collisions stimulates innovation and entrepreneurial opportunities (Roberts 2014). Networking assets (as defined in the following section) increase the potential for collisions, acting as a multiplierof the existing elements produced by the agglomeration effects in the city innovation ecosystem (see Figure 3.1). Source: Minges, 2014, adapted from Roberts, 2014. A list of categories of collaboration spaces is presented in Appendix D. Accelerators, incubators, angel investors, and venture capital are hybrid assets with economic assets but the impact of their network of mentors and entrepreneurs makes them more valuable for the growth and sustainability of the ecosystem; therefore, they are categorized as networking assets. The financing functions of these assets are included in economic assets under seed capital and financing. Table 3.1 presents an indicative list of networking assets. These initial findings support the hypothesis that networking assets are central to urban technology innovation ecosystems. This implies that networking assets are the connectors which: (i) sustain the social network of the ecosystem, and (ii) have the potential to boost the ecosystem’s growth by increasing the collisions that result from social connections. By being central to the ecosystem and these connections, networking assetswould play a critical role in the growth and success of urban technology innovation ecosystems. Either the social dimension of startups determines their success (in terms of capital raising) or success determines the of startups centrality for the ecosystem (in its social dimension). For future research, the sources of data will need to be expanded, additional cities will need to be researched (including those in both developed and developing countries), and the analysis of networking assets will need to include the remaining assets that could not be covered in the initial phase. This research will need to be carried out with research and city partners (see Appendix B). The scope of research will need to be expanded to include more cities. This includes working with partner cities to collect data through a common methodology agreed with the research partners. For the data collection process, cities will be prioritized based on those in the Working Group that have shown interest in participating in this process. The list of city members of the Working Group is shown in Appendix B. 1. Skills training for youth and entrepreneurs. The activity will develop a series of crowdsourcing competitions, which will include intense hand-on training (for example, bootcamp style) with a light acceleration phase. The result of this competition will be a series of startup projects (that is, minimum viable prototype beta tested, a business plan and a pitch). The competitions will also include an international mentorship program and exchange to connect the Lebanese ecosystem to others. In addition, this activity will create a university-industry platform for industry project training and a series of technology skills activities for schools. The university-industry platform will provide final-year students to team up with industry to solve real challenges from companies through a start-up or product projects in a 6-month timeframe. 2. Growth and sustainability of the tech-innovation community. The activity will develop network of mentors, links among entrepreneurs and networking events (for example, meetups) to support existing community. The activity will also complement existing collaboration spaces and provide technology tools (for example, maker space), labs (for example, living labs), and a space for community networking. This space will be managed by an innovation hub (the Mobile Innovation Hub, MiHub), which will serve to coordinate the community and the community-building activities. The MiHub will also take the role of promoting the community and its exemplary members. Sources: UN Data (2005 for Colombia and 2007 for Beirut), National Institute of Statistics of Chile (2002), Manizales City Hall (2012). Innovation Hub Although there is no common definition of an innovation hub, this concept can be applied to define the evolution of collaboration spaces into community managers that coordinate or integrate many of the other functions of collaboration spaces defined above, including coworking, maker spaces, fablabs, accelerators, living labs, and urban labs. Innovation hubs’ main function is to coordinate all actors or the ecosystem and help manage the community of tech-innovators and entrepreneurs to be sustainable and continue to grow. Many of these innovation hubs have participation of the most relevant actors of the technology innovation ecosystem, including entrepreneurs, universities, private sector, collaboration spaces, accelerators, incubators, and other providers of seed capital, community managers, and government, particularly city government. Some of these innovation hubs have collaboration spaces in their facilities, such as coworking and maker spaces, while others coordinate their functions with those spaces. Typically, these hubs will phase out their other functions when there are enough offerings for the community provided by third parties. For a detailed description of how this concept of innovation hub can be applied to develop and strengthen a technology-led innovation ecosystem, see description of the Lebanon Mobile Innovation Ecosystem Project at www.mie-p.org. Factory, Berlinhttp://www.factoryberlin.com/NUMA, Parishttp://en.numa.paris/Forum Virium, Helsinkihttp://www.forumvirium.fi/enRuta N, Medellinhttp://rutanmedellin.org/iHub, Nairobihttp://www.impacthub.net/Source: Mulas. 2014. In order to measure the value of networking assets in urban innovation ecosystems, the impact of connections on ecosystem success outcomes must first be understood. Once the value of incremental connections can be quantified, individual networking assets can be ranked and valued by multiplying their success in creating new connections by the value of incremental connections. Connections are defined as either social or geographic. While there are multiple metrics that can be used to define success, in this analysis the raising of a round of funding is considered as a successful outcome for startups and by extension the ecosystem as a whole. Where is the geographic center of NYC’s urban innovation ecosystem? The geographic center of NYC’s urban innovation ecosystem is located in Midtown Manhattan. Which people or organizations are located at the social center of NYC’s urban innovation ecosystem? While startups have the highest closeness centrality and are at the center of the social network, incubators have the highest degree, eigenvector, and “betweenness” centralities and are key connectors within the ecosystem. How do the geographic and social connectivity of startups influence their funding outcomes? Social momentum matters. The faster a startup gains second-order connections to investors, the more likely they are to successfully fundraise. A significant impact of geographic centrality on funding outcomes was not found. What is the relationship between geographic and social centrality? While startups in the geographic center of the startup scene may be highly connected, their connections are not as socially diverse. In summary, a relationship was found between social connections and funding outcomes within the NYC innovation ecosystem. Evidence was also found to support the hypothesis that networking assets are central to the urban innovation ecosystem. The urban innovation ecosystem is represented as a network of nodes and edges. Nodes are entities such as people and organizations, while edges connect nodes through their relationships. For example, a startup is a node. An investor is also a node. An investment is an edge that connects the startup and the investor. It can be difficult to determine which nodes fall within the scope of each city’s urban innovation ecosystem if one is focused solely on geography. What happens if a startup moves from one city to another? Or if a startup takes investment from a firm outside the city? Fortunately, the primary interest of this research is in mapping the social dimensions of the urban innovation ecosystem, so the dataset is more flexible in incorporating nodes outside of NYC. In order to define the scope of the data, the startups interviewed by Endeavor from 2013-2014 were first added as nodes. Next, the founders of these startups were added as additional nodes, and then their associated investors and incubators were added to the list of nodes. Finally, funded companies from which they sourced mentors, previously funded non-NYC startups, and former employers that have received funding were included as other nodes. The aim was to map the first and second-order network each startup can draw upon in order to reach investors. Accelerators support entrepreneurs and start-ups in early stages of development and they are often comprised of the following features: (i) a highly competitive and open application process for entrepreneurs, (ii) provision of small amounts of seed investment, (iii) focus on small teams rather than individual founders, (iv) intensive support for a limited period of time (usually 3-6 months), with active mentorship and networking, and (v) collaborative work among startups through cohort or classes of start-ups. Incubators are spaces that support start-ups by providing an office space and administrative support services. The most typical services are legal, recruiting, IT, accounting, public relations and pooled buying programs. In addition, incubators may also provide coaching, mentorship and help with access to funding at an ad hoc basis. Startups pay rent (which is usually below market rent) for the office space and there is normally not a time limit set for startups staying in the incubator (average staying ranges widely from 18 months to 5 years). Some incubator providers may ask for a profit share in the future or require minority stake in the startup as prerequisite to access the incubator. Nodes are never removed from the dataset, even if the represented entity no longer exists. In other words, once a startup appeared in the dataset, they were kept in the dataset for all subsequent years. There were two reasons for this decision. First, accurate end dates for startups were difficult to gather. Second, the primary interest was in mapping the social dimensions of the startup network, not creating a year-by-year catalogue of startups. Although startups may close, socially they still function as nodes within the urban innovation ecosystem that can introduce other nodes to second-order connections. As seen in Figure E.1, in 2014, the latest year of data within our dataset, there were 2,119 startups in the ecosystem. Although our dataset is smaller than the Digital.NYC and CrunchBase datasets (the largest publicly available databases of startups in NYC), which include about 6700 and 7500 startups respectively, the survey-based sourcing of our dataset is more helpful in obtaining historical connection data. However it is important to note that, when it comes to historical data, our dataset also shows survivorship bias. As such, our dataset is most accurately described as a year-by-year mapping of how founders of startups that existed in 2013-2014 evolved within the ecosystem. However, the fact that the dataset was sourced through surveys also introduces biases that we should be aware of. When interpreting the results within this paper, it is important to remember that our dataset comprises startups that have already “burst” onto the NYC startup scene. As such, these startups are more likely to have already existed for some time and are more likely to have already received funding. This effect may be seen in Figure E.2, where the number of new startups in our dataset drops after 2012. Given the consistent growth in the number of new startups in every year leading up to 2012, it is unlikely that there was a sharp decline in the number of new startups. Rather, it is more likely that there was a systematic bias in how interview targets were gathered that caused newer startups to be underrepresented. In addition to startups, our dataset also includes venture capital firms and incubators. The number of active NYC institutional investors is defined as institutional investors with locations in NYC who have made an investment within our dataset in that year or prior. Institutional investors include venture capital firms, banks, and investment arms of large corporations. The number of active NYC institutional investors jumped in 2000, grew steadily from 2000-2006, then grew more quickly from 2006 onward (Figure E.3). In addition to the NYC institutional investors, our dataset also includes institutional investors who have invested in at least one NYC startup but are located outside of NYC (Figure E.4). The number of active NYC incubators is similarly defined as incubators with locations in NYC who have made an investment within our dataset in that year or prior. The number of active NYC incubators grew steadily from 1995-2009, then grew more quickly from 2009 onward (Figure E.5). In addition to the NYC incubators, our dataset also includes incubators who have invested in at least one NYC startup but are located outside of NYC (Figure E.6). Our dataset also includes the number of active individual investors each year. Individual investors are commonly known as “angel investors.” Unlike institutional investors and incubators, location data for individual investors was not available, so we do not differentiate between individual investors located in NYC and those who do not. The number of individual investors in our dataset also rises rapidly beginning in 2009 (Figure E.7). In addition to startups and investors, our dataset also includes a few other organizations (Figure E.8). These are the funded companies from which startups have sourced mentors,18 previously funded non-NYC startups of founders, and former employers of founders that have received funding. These nodes exist to allow second-order connections to investors within the dataset to be measured. In addition to individual investors and founders, our dataset includes a few other individuals who were key employees at funded startups but not founders (Figure E.9). Our dataset comprises both individuals and organizations (Figure E.10). Technically, the network is bipartite. However, given that individual investors can function similarly to institutional investors and founders of small startups are practically synonymous with their companies, the network is treated as if it only contains one type of entity. There are a total of 30,440 total edges, or connections between the nodes (Figure E.11). These edges include all founding events,19 funding events, exits, mentorship, and employment relationships (Figure E.12). It is important to remember that edges represent distinct events—if an investor invests in a startup twice, there would be two edges between the startup and the investor. The vast majority of employment relationships observed in our dataset are the prior employment relationships of current startup founders. As such, the number of “current employment” edges is nonexistent in the most recent years. By looking at 2014 data, a quick summary of the types of connections seen in the dataset were generated (Table E.1.20 On average, each founder founded 1.12 companies, each startup received 5.90 investments, each incubator incubated 7.25 startups, each institutional investor made 2.76 investments, and each individual investor made 1.65 investments. A variety of tools were used for the analysis. Data was munged and cleaned using SQL and stored in a MySQL database. The graph data was then transformed into a Neo4j database. Neo4j allows us to store and search a directed graph database that captures the labels and properties of nodes and edges. It also allows for easy querying and visualization of subsets of the graph. Data was exported from the Neo4j database and imported into Gephi in order to quickly calculate network statistics such as centrality and degree. These values were then imported into Stata to be summarized and regressed. Maps were created using Tableau. Charts were created in conjunction with pivot tables in Excel. Our results are fourfold. First, the geographic dimension of the NYC urban innovation ecosystem was mapped and then the social dimension was mapped. Then, the interplay between the geographic dynamic, the social dynamic, and the funding dynamic within the ecosystem was examined. Finally, the interplay between the geography and social dynamic was explored. Research Question #1Where is the geographic center of NYC’s urban innovation ecosystem? It was possible to map the current locations of 70 percent of the NYC startups within our dataset (Figure E.13). Research Finding #1The geographic center of NYC’s urban innovation ecosystem is located in Midtown Manhattan. Research Question #2Which people or organizations are located at the social center of NYC’s urban innovation ecosystem? An analysis of network statistics indicates that the network is becoming more interconnected over time. Nodes have more direct edges over time (Figure E.15), and the average diameter and average path length decrease steadily post dot-com bust (Figure E.16, Figure E.17). 22 This may mean that players within the urban innovation ecosystem are more likely to know each other over time, but most likely it is because of better data population over time. In addition to network statistics, for each node the following statistics were also generated. The diagrams below, while not specific to our dataset, help illustrate the definition and interpretation of each type of centrality.23 Red indicates higher centrality values. Blue indicates lower centrality values. Degree centrality measures the number of other nodes within the ecosystem each node is directly connected to. It does not take into account any second-order connections. Closeness centrality measures a node’s social distance to other nodes. It is expressed as the inverse of the average distance from each node to every other node in the network. A low closeness centrality indicates that the firm is on the edge of the network. Eigenvector centrality augments degree centrality by taking into account the connectivity of the nodes a node is connected to. Highly connected nodes within highly interconnected clusters have high eigenvector centrality. Betweenness centrality measures how many times a node acts as a gateway in the network. The higher the betweenness centrality of a firm, the more paths run through that firm to connect two other firms. High betweenness centrality means that a node is a key bridge or facilitator between different clusters. Startups have the highest closeness centrality, while incubators have the highest degree, eigenvector, and betweenness centralities (Table E.3). These results support the hypothesis that incubators are key connection spaces within the urban innovation ecosystem. Research Question #3How do the geographic and social connectivity of startups influence their funding outcomes? In order to measure the impact of social and geographic connections on startup outcomes, measures of both types of connectivity in year n were regressed against the likelihood of obtaining funding in year n+1. A binary outcome was used, of either obtaining funding in year n+1 or not, rather than a continuous outcome, such as the size of the round obtained. This was because the latter is more likely to be influenced by the particular business opportunity rather than the ability to connect to investors. We hypothesize that there are unobserved omitted variables that vary by startup and as such a fixed effect model should be used, as opposed to a mixed effects model that assumes that unexplained fluctuations within the dataset are random and not inherently related to characteristics of each startup. In essence, this acknowledges that there are variables outside of our dataset, for example, the presentation skills of the founders, which influence funding outcomes. The hypothesis was tested using a standard econometric test called the Hausman Test (Table E.4). The results of the Hausman Test indicate that the coefficients under the fixed effects model are more likely to be consistent, so a conditional fixed-effects logistic regression was used on the panel dataset. This lead to the finding that social connectivity is more influential on funding outcomes than geographic connectivity (Table E.5). However, it cannot be concluded that geographic centrality does not influence funding outcomes. Historical geographic data for nodes was not available, so in order to test the influence of geographic connections on funding outcomes, it was assumed that companies had been located in or near their current location since founding. In other words, only the latest address was available, so in order to populate address data for previous years the assumption was made that the latest address was also the address at the time of founding. It is likely that this assumption does not hold, and that is why the results are not significant. Interestingly, the current number of second-order connections to investors also had an insignificant impact on funding outcomes in the following year. These are investor connections available through the startup’s founders, current employees, and past employees. In other words, these second-order investors are connections that are “a phone call away” when a startup decides to raise a round of funding. It was hypothesized that the number of second-order connections to investors would influence funding outcomes, so this result was surprising. However, given that our dataset is a more mature sample wherein most connections come from already receiving funding, it is likely that it was not possible to tease out the incremental effect of more second-order connections to investors after controlling for other investment-related variables because of an insufficient sample size of connections that occurred outside of funding events. What is significant is social momentum. The faster a startup gains second-order connections to investors, the more likely they are to successfully fundraise. In fact, each additional second-order connection to an investor increases the odds of raising funding in the next year by approximately 2%. This finding is interesting because it suggests that startups can ride the coattails of fundraising successes in their broader networks. Or, perhaps, combined with the finding that the absolute number of second-order connections to investors is insignificant, this result might suggest that the “freshness” of a connection is important, or that the value of connections possibly atrophies over time. However, we should exercise caution in interpreting the social momentum findings given that our dataset is primarily comprised of founders. What this means is that most second-order connections we observe are through founders and their previous employers or through employees that have gone on to found companies of their own. As such, not only is the observed sample of each startup’s associated personnel probably limited in comparison to the actual number of founders, employees, mentors, and advisors, the effect is probably overstated given that the average employee is unlikely to have the number and strength of investor connections as our observed set of founders. Finally, there are multiple nonconnectivity variables that are significant. A startup that has raised money this year is more likely to raise money next year. The more years a startup has existed and the more employee connections it gains, the more likely it is to raise funding. However, the more investments and investors a startup already has, the less likely it is to raise funding. This is probably because startups reach a threshold where they are self-sustaining enough to slow their fundraising efforts. Research Finding #3Social momentum matters. The faster a startup gains second-order connections to investors, the more likely they are to successfully fundraise. We could not find a significant impact of geographic centrality on funding outcomes. Research Question #4What is the relationship between geographic and social centrality? While location alone does a poor job of explaining centrality,28 the closer a startup is to other startups, the higher the startup’s degree, eigenvector, and betweenness centrality. Meanwhile, the closer a startup is to investors, the higher the startup’s closeness centrality. This result suggests that startups closer to other startups may be highly connected but within an insular startup community, while startups farther from other startups may be less connected but connected with a more diverse set of nodes. Research Finding #4While startups in the geographic center of the startup scene may be highly connected, their connections are not as socially diverse.? Our findings suggest that incubators are key networking assets within the urban innovation ecosystem, and the social dynamic is important for startups because increased social momentum can mean better chances of obtaining funding. However, our findings also suggest that while startups in the geographic center of the startup scene may be highly connected, their connections are not as socially diverse. However, without historical location data, we are unable to determine whether it is the social dynamic that influences the geographic dynamic or the geographic dynamic that influences the social dynamic. Do incubators form where there is already a critical mass of startup activity? Or are they the key players that build the social activity? Do startups form more connections when they are located in the geographic center of activity? Or do they move into the center of the city after already having already made the social connections? To answer these questions, we must obtain more granular timestamps for social and geographic changes. It would be informative, for example, to understand how many connections startups had before applying for incubation, and if it is the acceptance to the incubator that spurred their relocation or if they moved into the center of the scene beforehand in the hope of attracting funding and incubation. Victor Mulas leads this research and is the coauthor of this working paper with Hallie Applebaum and Michael Minges. Kathy Qian, Nga Phuong Nguyen and Mary Alexander Sherman conducted the data analysis. Matt Gee and Nick Eng from the University of Chicago (Computation Institute and Harris School of Public Policy) provided advice and guidance and participated in the research. Beatriz Eraso, Marta Milkowska and Scott Henry supported the team and contributed to the drafting and Colin Blackman edited this working paper and Samhir Vasdev was its creative director. The following colleagues peer reviewed or provided comments for this working paper: Maja Andjelkovic, Elena Gasol, Nicolas Friederici (Oxford Internet Institutue, Oxford University), Justin Hill, Tim Kelly, Stefano Negri, Arturo Muente-Kunigami Eric Strobl (Paris Ecole Polytechnique) and Ilari Lindy. Valerie Mocker, Kathleen Stokes, Alice Casey, and Kristen Bound, from NESTA, also provided support and connected us with other partners. The team would also like to express its gratitude to the professionals, practitioners and entrepreneurs for agreeing to interviews and for sharing their knowledge and experiences. A complete list of interviewees for this working paper is available in Appendix A. This research and its continuation would not have been possible without the support and encouragement of the research and city partners that have engaged with the team during this paper’s production (Appendix B). The team would like to especially thank the University of Chicago (Computation Institute and Harris School of Public Policy), Matt Gee and Nick Eng; Endeavor Insight, Rhett Morris and Matt Lerner; the offices of New York Council members Laurie Cumbo and James Vacca; and the New York Economic Development Corporation (NYEDC), Dmytro Pokhylko and Gianluca Galleto for their active collaboration and support in this research. The generosity of these partners has made this research possible and its results relevant by increasing the resources available to the team including providing insight and access to essential data sources and methodologies through the Global Entrepreneurship Research Network (GERN). Barrera, Alex. 2013. “The Spanish VC Industry Has One Big Problem: It Doesn’t Exist”. tech.eu.http://tech.eu/features/51/spain-vc-industry-missing/. Durst, Susanne, and Poutanen, Petro. 2013. “Success factors of innovation ecosystems - Initial insights from a literature review.”http://blogs.helsinki.fi/pkpoutan/files/2014/03/Durst_Poutanen_CO_CREATE2013.pdf. ———. 2013. “The New Global Startup Cities”. http://www.citylab.com/work/2013/06/new-global-start-cities/5144/. Miller, P. and Bound, K. 2011. The Start Up Factories.NESTA. http://www.nesta.org.uk/sites/default/files/the_startup_factories_0.pdf. ———. 2006. OECD Territorial Reviews: Competitive Cities in the Global Economy. http://www.oecd.org/gov/regional-policy/oecdterritorialreviewscompetitivecitiesintheglobaleconomy.htm. ———. 2010. Measuring Innovation: A New Perspective. http://www.oecd.org/site/innovationstrategy/measuringinnovationanewperspective-onlineversion.htm#agenda. United Nations. 2014. World Urbanization Prospects.http://esa.un.org/unpd/wup/Highlights/WUP2014-Highlights.pdf. ———. 2014. “American Community Survey.” http://www.census.gov/acs/www/. World Bank. 2014. Doing Business Database. February, 2015. http://www.doingbusiness.org/Custom-Query/chile. Víctor Mulas is a Senior Program Officer with Innovation Acceleration Program-Innovation Labs at the World Bank Group. Michael Minges is the lead consultant at ictDATA.org. Hallie Applebaum is an Open Innovation Specialist at the World Bank Group.